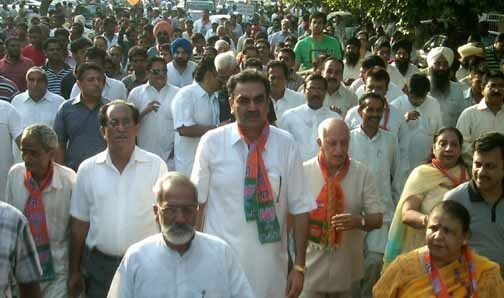 Bharatiya Janata Party Chandigarh today organized massive Padyatra in Ward No. 17 to aware the general public about the corruption and mal-administration of Congress and its leaders. Prominent party leaders present on the occasion include Party President Sh. Sanjay Tandon, former Union Minister Sh. Harmohan Dhawan, former MP and National Incharge Legal Cell Sh. Satya Pal Jain, Smt. Arun Bala Vij, Devinder Singh Aulukh, B.C. Puri, Asha Jaswal, Arun Goyal, Ravi Prakash Kansal, Shyama Negi, Heera Negi, Santosh Sharma, Maheshinder Singh Sidhu, Roopi Singh among others. Party Activists raised slogans against the Congress led UPA Government and its corrupt ministers and demanded disclosure of names of persons having accounts in foreign banks.BJP State President Sh. Sanjay Tandon said that the local Member Parliament and Central Parliamentary Affairs Minister Pawan Kumar Bansal is not paying any heed to problems of local residents. He is involved in corrupt practices and has nothing to do with the grievances of voters of his constituency. The residents of various colonies are suffering a lot due to the negligent behavior of local Member Parliament Pawan Kumar Bansal. Sh. Tandon further said if Pawan Kumar Bansal have no time for the people of Chandigarh he have no right to remain Member Parliament from Chandigarh constituency and he should resign from his post as he failed to keep the promises made to the residents of city during the parliamentary elections. Former Union Minister Sh. Harmohan Dhawan said that party had given sufficient time to the Administration to take appropriate action against the corrupt practices of local Member Parliament P.K.Bansal and other Congress leaders. But the Administration did not take any action due to which the party Party decided to take the matter to the streets and started the Janjagran Abhiyan. Former Member Parliament Sh. Satya Pal Jain said that the residents of city are much fed with the corrupt practices of Congress leaders. Central Parliamentary Affairs Minister Pawan Kumar Bansal and other Congress leaders are busy in their corrupt practices and are not interested in development of the city.